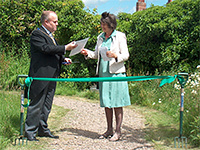 Long Lane Pasture Trust is a charity registered in England & Wales (No. 1122236) and is run in accordance with its Trust Deed. It has five Trustees who are all long-standing Finchley residents: Dennis Pepper (Chairman), Harriet Copperman (Vice Chairman), Wayne Armsby (Treasurer), Maureen Delandro and Donald Lyven. 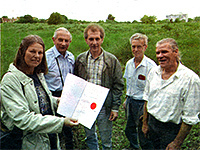 The Trust was established in April 2006 in order to protect, restore and manage the Pasture. It holds a 25 year lease from London Borough of Barnet and is responsible for maintaining and safeguarding the land for the benefit of the community. The Trust took over the assets and replaced the now defunct Long Lane Pasture Action Group, a pressure group set up to prevent houses being build on the land. Details of the Trust’s achievements and finances are available in its Annual Reports and Accounts. An Annual Meeting is held once a year on the Pasture to report to all our Friends. 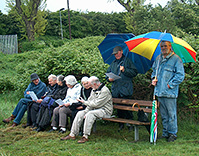 The Trust is managed wholly by volunteers and has no paid staff. A Management Committee meets monthly to plan the works and activities. In addition to the Trustees, the Committee member: Linda Dolata. Long Lane Pasture Trust relies on donations to protect, maintain and restore the Pasture. It has received generous grants from the Postcode Lottery Trust, Panton Trust, Rowse Honey, Big Lottery (Awards For All and BBC Breathing Places), the City Bridge Trust, the Milly Apthorp Charitable Trust, Grassroots Grants, and Neighbourhood Renewal. Organisations which have supported our work include BTCV, The Finchley Society, and The Barnet Federation of Allotment Societies. Above all, we have received many donations from individuals without whose contributions we would not have been able to safeguard this land. If you wish to make a donation, please print out and complete a donation form.